Today, we will present you the stages of the interview, for you know what to expect that day. Being an Open Day session, anyone that corresponds the requirements may attend the interview, without prior registration on the site. Each candidate comes forth to the recruiter where he leaves the resume and photos and responds to 1 or 2 questions such as “Why do you want to be a flight attendant?” or “Why did you choose Qatar Airways?”. After this conversation with the recruiter, they will let you know if you are invited for the interview the next day, or not. Starts very early in the morning (at about 7 or 7.30 am.). First, the candidates will be presented the company and life in Doha. Next, the written English test which lasts 45 minutes and consists of 5 types of exercises: text dependent questions (answer questions related to a given text), multiple choice (choose the correct answer from the ones given), fill in the blanks with the appropriate word, 5 mathematical lateral logic questions and an essay on a given subject. The difficulty level is medium (B1 or B2) and aims to measure your ability to understand English language, grammar and fluency level and so on. After the written English test, there is an oral test: each candidate enters a room, extracts a word from a bowl and has to speak about it for as much as possible. 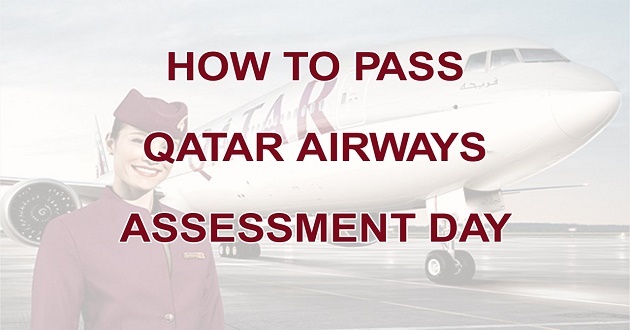 During this speaking exercise, the reach test is performed (one of the compulsory requirements of Qatar Airways is to be able to reach 2,12meters, while on your tiptoes and with your hand raised, without wearing any shoes) and recruiters also ask each candidate about any distinctive marks or tattoos (tattoos are prohibited at Qatar Airways). A round of eliminations follows next. Those who qualify, enter the group games. Candidates are divided into teams and are given a task to be solved in about 15 minutes. After the group games, a new round of eliminations takes place. The lucky ones get to the “grand finale”, which is the final interview. Before the interview, they are told about the payroll and benefit package the Qatar Airways flight attendants receive . The final interview takes about 5 to 10 minutes for each candidate and focuses on a series of questions based on your CV, previous experience, readiness to relocate and so on. 1. You must get home before 4 am, even if you’re free the day after. 2. Your father or brother cannot live in the same building with female flight attendants while on holiday. 3. You cannot use the phone or use any electronic device when you’re on the bus to and from work. The final answer will be sent to each candidate via email, about 2 weeks after the final interview or sometimes later (time varies from one candidate to another). Good luck! Wishing you to take off!